Manufacturing & Fabricating Advertiser Index COMPANY CIRCLE NO. PAGE All Wood Cabinetry 30 53 Antolini 20 31 Blum Inc. 24 34 BSH Home Appliances Corp. 15 23 Cabparts, Inc. 22 33 Chemical Concepts 14 22 Chief Architect 16 25 Cosentino S.A. 29 45 Custom Building Products 100 63 Custom Inserts 104 63 Delta Faucet Co. 1 2 Doug Mockett 11 17 Forevermark Cabinetry 34 65 Grass America Inc. 10 16 Houzer Inc. 26 27 Imperial Cal. Products 101 63 InSinkErator 13 21 International Woodworking Fair 31 55 JSI Quality Cabinetry 27 40 Karran USA 28 43 KCD Software 8 14 Kohler 4 11 COMPANY CIRCLE NO. PAGE Laufen 7 13 LG Electronics 2 4 Moen 19 39 Nantucket Sinks 6 12 Outwater Plastics 105 63 Panasonic 25 35 Remodeling Show | DeckExpo | JLC LIVE 33 61 RICKI - Research Institute of Cooking & Research Inelligence 32 & 37 57 SEN Design Group 38 62 Showplace Wood Products 21 32 Stanisci Design 102 63 Strom Plumbing by Sign of Crab 23 33 Sub-Zero Inc. 12 19 SUNNY WOOD 5 12 SuperbrightLEDs.com 36 60 Top Knobs 9 15 UltraCraft Cabinetry 35 66 Vauth-Sagel 18 29 Vent-A-Hood 3 7 WalzCraft 103 63 White River Hardwoods 17 26 Gray Finishes Enhance Cabinet Doors WalzCraft has added three SolidTone colors to its line of fnish options for custom cabinet components. The new SolidTone paint hues include gray tones ranging from light to dark and are made of pigmented, acid Catalyzed Conversion Varnishes that provide scratch and chemical resistance. The three fnishes are: Castle Gray SolidTone, left, shown on a Transitional door design; City Gray SolidTone, center, shown on an American Classic door design, and Stone Gray SolidTone, right, shown on a Shaker door design. www.walzcraft.com Circle No. 230 on Product Card Posts Complement Kitchen Island Designs Classic Island Post designs from Castlewood complement a wide variety of kitchen island confgura- tions. Available in birch, cherry, maple, red oak and rubberwood, each post is expertly turned and hand sanded. Fifteen designs are available in diameters ranging from 3" to 8". www.castlewood.com Circle No. 229 on Product Card Classifed Advertising READY TO RETIRE Selling 8,000 sq. ft. commercial bldg. Established (25 yrs.) with lovely 2 bedroom apartment and ofce above showroom. Working cabinet shop and design center. Property is located in beautiful coastal community in the Pacifc, NW. For more info contact denmannoah1@yahoo.com NEWBERRYÕS DESIGNS UNLIMITED New Mexico 29 yr. old established design frm for sale. Cabinets, Countertops and Floorcoverings. Owners retiring. Trained staff willing to stay on. Serious inquires only. (575)748-9775 or (575)746-3461 REP FIRMS SEND US YOUR RESUMES WW Wood Products is seeking estab- lished independent reps to recruit and service cabinet dealers in select terri- tories throughout the U.S. WW Wood Products has a major presence in most markets throughout the U.S. with a very low rep agency turnover rate. Represent a FAMILY OWNED manu- facturer with an outstanding reputation and three very competitive lines to market to kitchen and bath dealers: • Shiloh Cabinetry - plywood semi- custom, w/ overlay and inset cabinets • Eclipse Cabinetry - 3/4Ó frameless w/ options of our Shiloh line, plus more • Aspect Cabinetry - value oriented cabinet ideal for kitchen-at-a-time dealer Contact Ken Carmode at: ken.carmode@wwwoodproducts.com or Independent Sales Representatives Mouser Cabinetry is seeking independent sales representatives with at least 5 years custom and semi-custom cabinet design and sales experience for several sales territory opportunities. Candidates must be capable of developing and maintaining successful relationships with existing kitchen & bath retail accounts while cultivating partnerships with new dealers. Visit www.mousercc.com Forward your confdential resume to: smouser@mouserc.com spfster@mouserc.com Mouser Cabinetry, LLC 2112 North Dixie Avenue Elizabethtown, KY 42701 Phone: 270-737-7477 Woodharbor Custom Cabinetry seeks result oriented independent sales representatives with successful sales history to represent our custom/semi-custom/stock cabinetry lines in select territories. Excellent follow up skills and ability to support and build existing network are essential. Submit resumes to: jsnow@woodharbor.com Woodharbor Custom Cabinetry 3277 9th SW Mason City, IA 50401 Ph: 641/423-0444 Get started by calling us at 212-419-4537 sell@kitchentrader.com | Visit our newly designed website: www.kitchentrader.com • Receive Thousands - for showroom displays and pre-owned luxury kitchens • Nationwide Buyers - a large network of global buyers • White Glove Service - professional, insured crews for removal, pack & transport Wanted to Buy: Surplus Building Materials Clean o your Dock and get paid for it. We buy discontinued products, wrong orders, dead inventory. No job too big. Call 717-249-2329 Ideal for: ■ Hiring Employees ■ New Business Opportunities ■ Selling Equipment ■ Situations Wanted ■ Close-Outs for Sale Classifieds Get Results For more info contact: Nancy Campoli (800) 547-7377, ext. 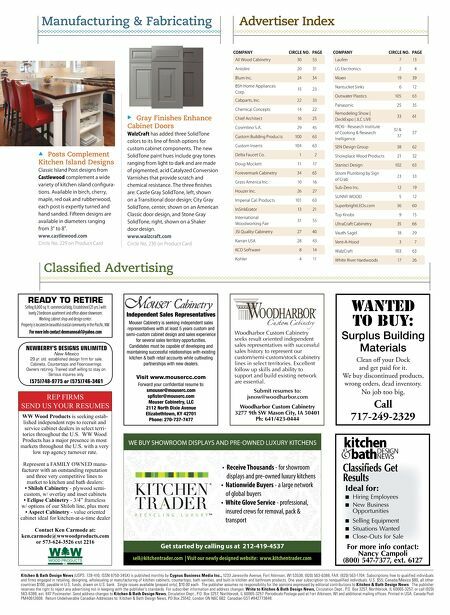 6127 Kitchen & Bath Design News (USPS: 728-410, ISSN 8750-345X) is published monthly by Cygnus Business Media Inc., 1233 Janesville Avenue, Fort Atkinson, WI 53538; (920) 563-6388; FA X: (920) 563-1704. Subscriptions free to qualified individuals and firms engaged in retailing, designing, wholesaling or manufacturing of kitchen cabinets, countertops, bath vanities, and built-in kitchen and bathroom products. One year subscription to nonqualified individuals: U.S. $55; Canada/Mexico $80, all other countries $100, payable in U.S. funds, drawn on U.S. bank. Single issues available (prepaid only), $10.00 each. The publisher assumes no responsibility for the opinions expressed by editorial contributions to Kitchen & Bath Design News. The publisher reserves the right to reject any advertising not in keeping with the publisherÕs standards. For subscriber information and address changes: Write to Kitchen & Bath Design News, Circulation Dept., P.O. Box 3257, Northbrook, IL 60065-3257, or call (920) 563-6388, ext. 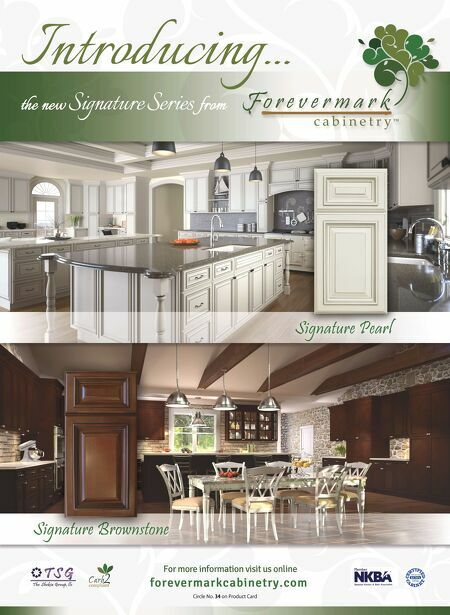 847 Postmaster: Send address changes to Kitchen & Bath Design News, Circulation Dept., P.O. Box 3257, Northbrook, IL 60065-3257. Periodicals Postage paid at Fort Atkinson, WI and additional mailing offices. Printed in USA. Canada Post PM40612608. Return Undeliverable Canadian Addresses to: Kitchen & Bath Design News, PO Box 25542, London ON N6C 6B2. Canadian GST #842773848.